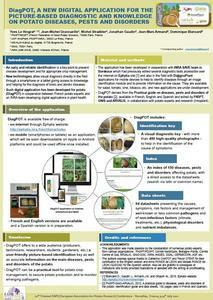 DiagPOT is a digital application containing a picture based diagnostic tool to help in the identification of major symptoms on potato crop and tubers. Moreover, the application contains information on diseases, pests and potato disorders including major risks factors and ways to control them. Initiated by FN3PT, this application started with an update of the well-known « A practical Guide to Diseases, Pests and Disorders of the Potato » jointly published by FN3PT, Arvalis and Gnis. 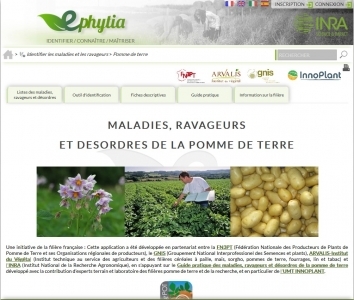 Contributors came from numerous field and research experts such seed potato growers regional organisations (Bretagne Plants, Comité Nord and Comité Centre & Sud), INRA UMR Igepp via InnoPlant joint technical unit, ANSES, DGAL, Germicopa, ASF, …. This content was combined to the know how on digital and mobile applications development provided by INRA (UMR SAVE de Bordeaux). Mobile app is also coming soon. Feedbacks are welcome for the improvement of this new tool..